The Mecklenburg Declaration of Independence is the name given to a document that was allegedly produced on 20 May 1775, when the residents of Mecklenburg County declared themselves "free and independent people." The so-called declaration did not surface until 1819, 44 years after the event, when it was published in the Raleigh Register at the behest of U.S. senator Nathaniel Macon. The original document was supposedly destroyed in a fire in 1800, and the published text was reconstructed from memory by John McKnitt Alexander and given to Macon by his son, William Alexander. William Polk, the son of the organizer of the Charlotte meeting, gathered testimony from several elderly men who claimed to have been present. Mecklenburgers immediately started celebrating the date. The authenticity of the document was not seriously questioned until the posthumous publication of the works of Thomas Jefferson in 1829. 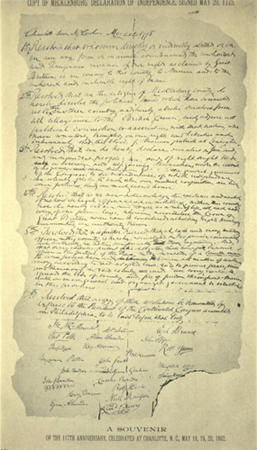 In a letter of 9 July 1819 to John Adams, Jefferson dismissed the Mecklenburg Declaration as a hoax. The North Carolina legislature in 1830-31 was so aroused by this development that it established a committee to investigate. As committee chairman Thomas G. Polk organized the fiftieth anniversary celebration of the Mecklenburg Declaration, it is not surprising that his committee gathered evidence to support the contention that the declaration was authentic. Despite North Carolina's efforts, a number of scholars outside the state maintained that the Mecklenburg document was a fraud. The ultimate scholarly blow came in 1907 with the publication of William Henry Hoyt's The Mecklenburg Declaration of Independence: A Study of Evidence Showing That the Alleged Declaration of Mecklenburg County, North Carolina, on May 20th, 1775, Is Spurious. Using the latest methods of scientific history and internal criticism, Hoyt maintained that the evidence was overwhelming that the reconstructed declaration was a misconstruction of the Mecklenburg Resolves of 31 May 1775, which contemporary newspapers proved had been written. Most North Carolinians ignored Hoyt's work, but not Samuel A. Ashe, editor, historian, and descendant of one of the state's most prominent families. The first volume of Ashe's History of North Carolina (1908) presented both sides of the issue but ultimately agreed with the naysayers. A bitter fight broke out in the North Carolina General Assembly over a bill authorizing the purchase of Ashe's book for the public schools. House Speaker Augustus W. Graham, the son of a governor and descendant of a "signer" of the Mecklenburg Declaration, took the floor and defeated the authorization bill. Opponents of the measure, appealing to patriotism, noted that the date of 20 May was enshrined on the state flag and seal. However, the difference in the old style (Julian) and new style (Gregorian) calendars was 11 days at the time the British adopted the new style in 1752. Even in 1775, Charlotte was in a remote area, and some persons still may have been using the old calendar. This fact could have contributed to a misapplication of the 20 May date to the authentic Mecklenburg Resolves of 31 May 1775. The negative opinions of professional historians toward the Mecklenburg Declaration, including such luminaries as Stephen B. Weeks, John Spencer Bassett, and R. D. W. Connor, remained intact. The one academic who did support the Mecklenburg legend was Archibald Henderson, a mathematics professor at the University of North Carolina at Chapel Hill. Although modern scholars no longer accept the Mecklenburg Declaration as authentic, it has long been maintained and celebrated. The document emerged at a time when North Carolina was the sleeping and backward "Rip Van Winkle State" and thus appealed to pride by establishing that the state was not only progressive but also in the vanguard of the independence movement. Richard N. Current, "That Other Declaration: May 20, 1775-May 20, 1975," North Carolina Historical Review 54 (April 1977). Ronnie W. Faulkner, "Samuel A'Court Ashe: North Carolina Redeemer and Historian, 1840-1938" (Ph.D. diss., University of South Carolina, 1983). Souvenir depicting the Mecklenburg Declaration from The Mecklenburg declaration of independence : a study of evidence showing that the alleged early declaration of independence by Mecklenburg County, North Carolina, on May 20th, 1775, is spurious. Online at http://archive.org/details/mecklenburgdecla00hoytuoft. Accessed 5/1/2012. 1 January 2006 | Faulkner, Ronnie W.
I'm a direct descendant of Capt James Jack who rode horseback to Philadelphia to deliver the Mecklenburh resolutions. My mother researched our family history in libraries in the 1970-80's. In it I got the story of the Mecklenburg Declaration of Independence. When the resolution was delivered, the delegates weren't ready to declare war but Capt Jack stated, " You can memorialize your King but for me & Mecklenburg county, we declare independence from Great Britain" N.C. declared independence in 1775, period! I have an old slate with the meckl declaration of independence . My mother gave to me, many years ago, a 3 ring binder with our "family tree" info. In it was the story, taken from a book in the library that told of my ancestor, Capt. James Jack, who rode horseback with the Mecklenberg resolutions. When presented to delegates in Philadelphia, he was told " they weren't ready for war". Before he left for N.C., he said "Gentleman, you may debate here about reconciliation & memorlize your King, but bear it in mind, Mecklenburg owes no allegiance to, & is seperated from G.B. forever". I know nothing of the papers in question only that it is to me believable ,as a lot of those people experienced first hand the British tyrany and they all felt the same. Here is a recent interview with DG Martin on the whole subject of the MecDec, for those interested. Or visit May 20th Society on Facebook. Thanks for sharing this with NCpedia viewers! As these comments so aptly demonstrate, memory is a powerful force (especially family memories) and often trumps history. I know nothing about the Mecklenburg declaration but I have an Orig. Sept. 20 1838 Niles National Register. It has the Mecklenburg declaration in it. The Niles paper states "A late number of the Southern Literary Messenger contains this famous document which we subjoin"
I too have decedents related to the Mecklenburg Declaration ( Hezekiah Alexander ) signed the Mecklenburg Declaration. Searching all this information has been fun and fun exciting. On my Fathers side William G Broadwell born in Kansas City July 1943 we traced his family back to one of the 13 Colonies and found relative's lived in what is now called New Jersey and later moved to Clinton New York before new generations moved to Penn and later to Missouri and so on. To me Its better than any movie and should be explored a little further. And to find out the Declaration of Independence originally came from Charlotte and called the Mecklenburg Declaration and celebrated every May 20th for a great number of years calling the holiday Mec Dec Day this is all jaw dropping to our family. Enjoy your search, Wm Broadwell. I am a direct decedent of John McKnitt Alexander, Hezekiah Alexander, and Abraham Alexander. I am interested in finding a copy of the Mecklenburg Declaration for our family archives. My ancestry search has been very interesting. I was searching the Crowe family (who had a marriage to an Alexander) and discovered this branch - very exciting! Any suggestions on how to obtain a copy of the Mecklenburg Declaration is appreciated.